Age Restrictions: The show is suitable for children aged 8 and over. The puppetry and visual elements will appeal to younger people, but some of the scientific content may go over their heads. Please note the production is not suitable for children under 3 and babes in arms, who will only be admitted at the discretion of the theatre staff. Join the 22-year-old Darwin on HMS Beagle's daring voyage to the far side of the world, and discover the gripping story behind one of the most important discoveries in history. 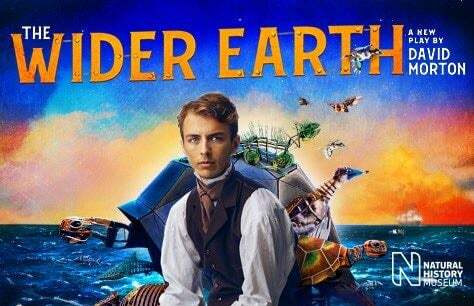 The Wider Earth features a cast of seven, remarkable puppetry, an original score and cinematic animations to bring to life uncharted landscapes in the theatrical event of 2018. Please note patrons attending MATINEE PERFORMANCES may enter the museum through the Cromwell Road or Exhibition Road entrances. Patrons attending EVENING PERFORMANCES MUST use the Queen's Gate entrance ONLY and are advised to arrive at least 30 minutes prior to the show. Superb new play, great acting, versatile set and enchanting puppetry.